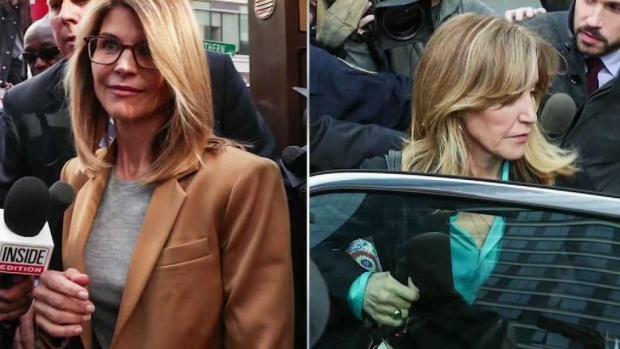 Actresses Lori Loughlin, Felicity Huffman, and other wealthy parents charged in a college admissions scandal appeared in court in Boston. The two actresses and Loughlin's fashion designer husband, Mossimo Giannulli, were not asked to enter a plea and remain free on bail. Dozens have been charged for a scheme in which parents bribed coaches and helped rig test scores to get their children into elite colleges. Hollywood stars Felicity Huffman and Lori Loughlin appeared in federal court Wednesday alongside other wealthy parents to face charges they rigged test scores or paid bribes to cheat the admissions process at prestigious universities. The actresses, along with Loughlin's fashion designer husband Mossimo Giannulli and dozens of others, were charged last month in a scheme in which authorities say parents paid an admissions consultant to bribe college coaches and rig test scores to get their children into elite universities. Huffman entered the court several hours before her hearing. Loughlin arrived shortly before the 2:30 p.m. hearing and took time to greet fans outside. Both actresses were released on bail, their hearings lasting only a few minutes. They were not asked to enter a plea. Neither Huffman nor Loughlin and Giannulli have publicly commented on the allegations. This was their first appearance in Boston's federal court. Hollywood actresses Lori Loughlin and Felicity Huffman are among those charged in the college admissions scandal. Giannulli, whose Mossimo clothing had long been a Target brand, arrived at the courthouse before Loughlin. The Hallmark Channel — where Loughlin starred in popular holiday movies and the series "When Calls the Heart" — cut ties with Loughlin a day after her arrest. Among the other parents appearing in court Wednesday was Gordon Caplan, former co-chairman of the international law firm Willkie Farr & Gallagher, based in New York. Lori Loughlin arrives at Boston federal court on Wednesday to face charges that she participated in a college admissions cheating scam. Meanwhile, a packaged-food entrepreneur from California became the first of the 33 parents charged in the scandal to agree to plead guilty. Several coaches have pleaded not guilty, including tennis coach Gordon Ernst who's accused of getting $2.7 million in bribes to designate at least 12 applicants as recruits to Georgetown.